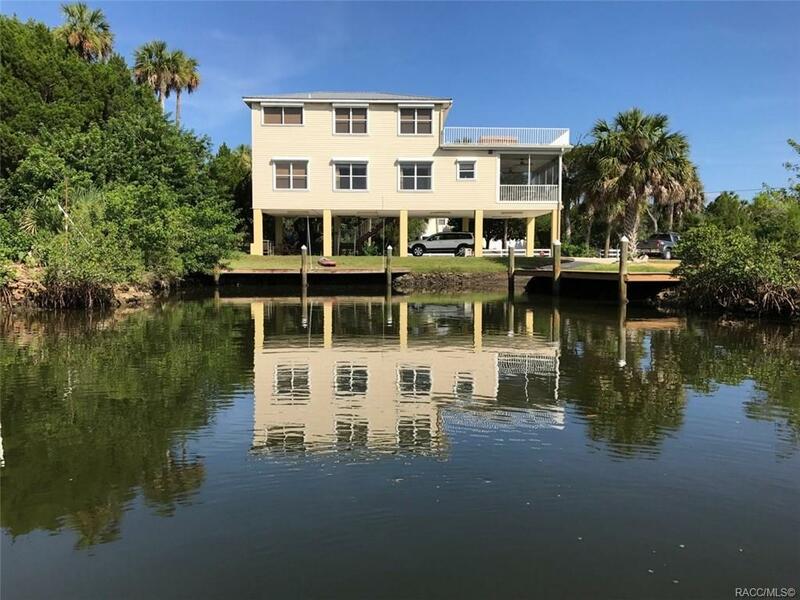 Fish N Palms is a show-stopper two-story waterfront stilt home with two boat docks and a private boat ramp. The stunning interior is decorated with Tommy Bahama furnishings and has quality like quartz countertops, solid wood doors/cabinets/trim, and lots of windows. The home is immaculately clean and well-maintained. The top floor is ALL master suite, complete with French doors to a giant deck to watch glorious sunrises, sunbathe, or take in breathtaking views on a full moon night. The first floor is open with kitchen, gorgeous carved wood dining table, and living area. The first floor also has the second bedroom, bathroom and French doors to a screened porch where youâll enjoy grilling with friends and family. Turnkey furnishings include everything from linens to kitchenware--itâs ready for you and/or vacation rental guests. At Fish N Palms youâll be close to nature, paradise, and world-class fishing, amazing scalloping, great kayaking and watching dolphins and manatees. Directions: Take State Road 19/98 And Turn Onto Ozello Trail (Only One Way To Turn). Go 9 Miles To Dead End Of Ozello Tr., Go Left On Sand Dollar, Go Right On N. Lake Circle. 515 On N. Lake Circle On The Right.